Please note: this have previously been on our other blog, but since it's travel related, we wanted to re-post it here! As the planner freak that Jessica is, booking in advance has always helped, and to be more precise - 12 weeks in advance. So apparently, this is the time that most, if not all all train services realises their advance tickets for 3 months ahead! Seriously, as much as it sounds ridiculous to be booking so early, it does make a big difference in price, you could get away with it some weeks, but it's better to be safe than sorry. 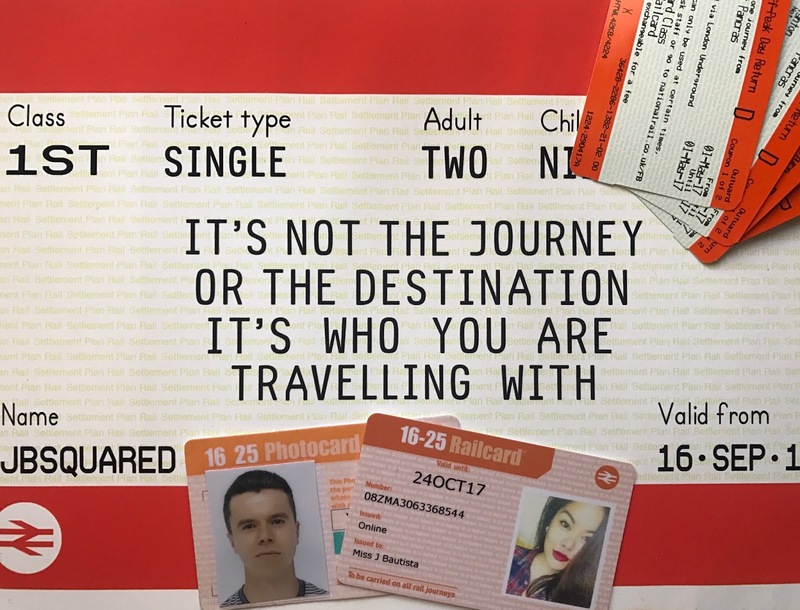 As you can guess, we both have the 16-25 railcard, it only costs £30 a year (£70 for 3 years), even if you use it 3 times, I bet you would already have your monies worth. Even if it was to use it to take a spontaneous trip to Southend-on-sea, who doesn't like to save a bit of money. Also, we have also just recently found out that it could also give you a third off your pay-as-you-go/travelcards with your London Oyster card. So that's definitely a plus if you live in London. You can find details to all the individual cards and apply here. In the beginning, I was completely oblivious to where I should buy my tickets, Google was my best bet and clicking on the first link was good enough for me (of course, knowing if it was legit and all that) but nevertheless, I thought it was completely normal to have booking fees and card fees, well little did I know. I know £2 isn't much, but when you're buying tickets every week, a little goes a long way. You would think that buying a return ticket is cheaper right? Wrong. In most cases for me, we have noticed that buying two single tickets, for the same train times, have worked out so much cheaper. Luckily, in the National rail app, it gives you both options and prices to see both return and single prices, so it's so much easier to compare without having to do all the hard work. For example, a return ticket could cost us £56.75 return from London to Sheffield, but buying two singles could get me down to £36.50 - what a difference that is! We can't explain to you how they work that one out, but yes, keep this in mind. To be honest, we never actually used this tool, as it didn't really apply to us, due to the fact that we followed the first 3 steps above, and we believe it also had to do with the route itself - there wasn't much to cut down on. Although, we could be wrong, find out if it works for you here. Add to the list and tell us what other tips & tricks have you used to help you save money on train tickets with commenting below. I definitely needed this post, I spend so much on rail fares! I didn't realise you could get tickets in advance without paying a booking fee, I'll definitely be checking that out next time. My tip would be, if you travel regularly, you can get cash back on your tickets! So my fiancé used to do a £100 round trip every week to see me (crazy I know) and he joined a cash back website for like £5 a month but in return he received £30 back for every ticket he bought, so £120 a month! It really helped a lot! I always buy single tickets instead of returns. I've heard of split ticketing but never done it, seems like it's a bit fiddly to me. My rail card is a total godsend, it has saved me so much money over the years! I only recently found out about split ticketing and its well worth doing, it's really surprising how much you can save! Looking in to possible alternatives to train travel are really valuable too, sometimes you can get a megabus for a fraction of the price, although naturally this will increase your journey time! Fab post!